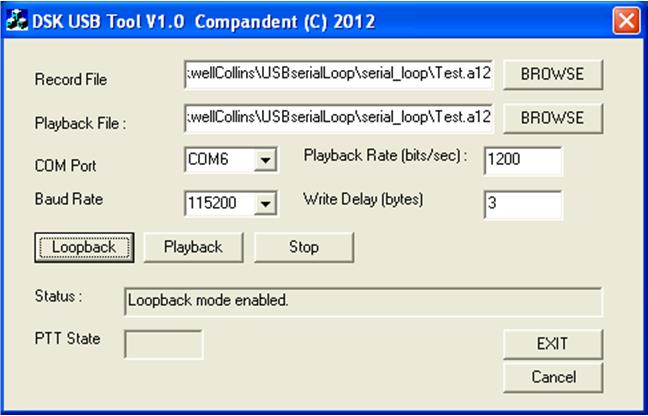 Compandent can provide its customers with a specially developed C++ sample program for full duplex exchange of MELPe compressed bitstream between PC and FLEXI-232 via USB or RS-232 ports, for record + loopback or playback. Such a program may be used as an example for developing applications such as MELPe VoIP between PCs and other MELPe VoIP terminals. The program is provided as MSVC++ project. The block diagram of a communication system including a PC and data terminal is illustrated in Figure 1. Figure 1 Block Diagram of PC and data terminal system (USB or RS-232). (c) All rights reserved. Figure 2 Block Diagram of Common PC and FLEXI-232 Based VoIP System. (c) All rights reserved. Upon startup the program shows the following window. Set the correct COM port number, select the desired MELPe rate. You can browse and set the “Record File”, and the “Playback File”. These files contain MELPe compressed data (at the selected rate). Figure 3 Dialog window of Compandent's sample program communicating MELPe bitstream between PC and FLEXI-232. (c) All rights reserved. iPhone and Android mobile device application using MELPe STANAG-4591. Compandent provide sample mobile application.